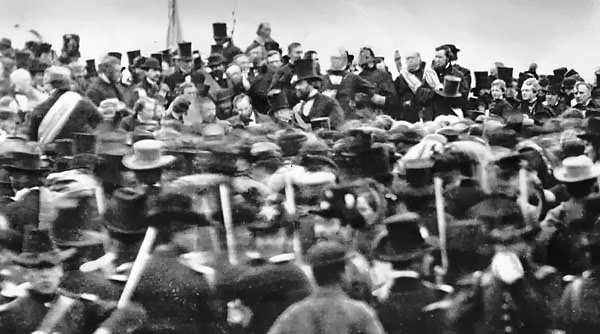 Today is the sesquicentennial of the Gettysburg Address. It was one of the great moments in oratory and my great aunts believed in elocution as sport. Needless to say, I learned to recite the Gettysburg Address at an early age. This copy was given to the stepson of historian George Bancroft. Lincoln was asked by Bancroft for a handwritten copy to raise funds for soldiers. Lincoln complied but wrote on both sides of he paper, making it hard to display, so Lincoln made another copy for Bliss. It resides in the White House in the Lincoln Room. Since this copy was unusable for fundraising, Bancroft kept it. It is owned by Cornell University. Four score and seven years ago our fathers brought forth, on this continent, a new nation, conceived in Liberty, and dedicated to the proposition that all men are created equal. Now we are engaged in a great civil war, testing whether that nation, or any nation so conceived, and so dedicated, can long endure. We are met on a great battle-field of that war. We have come to dedicate a portion of that field, as a final resting-place for those who here gave their lives, that that nation might live. It is altogether fitting and proper that we should do this. But, in a larger sense, we can not dedicate, we can not consecrate – we can not hallow – this ground. The brave men, living and dead, who struggled here, have consecrated it far above our poor power to add or detract. The world will little note, nor long remember what we say here, but it can never forget what they did here. It is for us the living, rather, to be dedicated here to the unfinished work which they who fought here have thus far so nobly advanced. It is rather for us to be here dedicated to the great task remaining before us – that from these honored dead we take increased devotion to that cause for which they here gave the last full measure of devotion - that we here highly resolve that these dead shall not have died in vain – that this nation, under God, shall have a new birth of freedom, and that government of the people, by the people, for the people, shall not perish from the earth. Nicolay was President Lincoln's personal secretary. historians believe this is the first draft of the address begun in DC on White House stationary. Since the second page of the draft is on different, it is thought that Lincoln finished the speech on his way to Gettysburg. Nicolay, who saw the Lincoln deliver the speech in Gettysburg, was given the draft. It is now in The Library of Congress. Four score and seven years ago our fathers brought forth, upon this continent, a new nation, conceived in liberty, and dedicated to the proposition that “all men are created equal.” Now we are engaged in a great civil war, testing whether that nation, or any nation so conceived, and so dedicated, can long endure. We are met on a great battle field of that war. We come to dedicate a portion of it, as a final resting place for those who died here, that the nation might live. This we may, in all propriety do. But, in a larger sense, we can not dedicate – we can not consecrate – we can not hallow, this ground – The brave men, living and dead, who struggled here, have hallowed it, far above our poor power to add or detract. The world will little note, nor long remember what we say here; while it can never forget what they did here. It is rather for us, the living, we here be dedicated to the great task remaining before us – that, from these honored dead we take increased devotion to that cause for which they here, gave the last full measure of devotion – that we here highly resolve these dead shall not have died in vain; that the nation, shall have a new birth of freedom, and that government of the people, by the people, for the people, shall not perish from the earth. Presidential assistant, John Hay, was also with Lincoln at Gettysburg. His copy is believed to be the second draft of the speech. Hay wrote in his diary: "The President, in a fine, free way, with more grace than is his wont, said his half dozen words of consecration." This copy, complete with handwritten changes, is owned by the Library of Congress. Four score and seven years ago our fathers brought forth, upon this continent, a new nation, conceived in Liberty, and dedicated to the proposition that all men are created equal. Now we are engaged in a great civil war, testing whether that nation, or any nation so conceived, and so dedicated, can long endure. We are met here on a great battlefield of that war. We have come to dedicate a portion of it, as a final resting place for those who here gave their lives that that nation might live. It is altogether fitting and proper that we should do this. But in a larger sense, we can not dedicate — we can not consecrate — we can not hallow — this ground. The brave men, living and dead, who struggled here, have consecrated it far above our poor power to add or detract. The world will little note, nor long remember, what we say here, but can never forget what they did here. It is for us, the living, rather to be dedicated here to the unfinished work which they have, thus far, so nobly carried on. It is rather for us to be here dedicated to the great task remaining before us — that from these honored dead we take increased devotion to that cause for which they gave the last full measure of devotion – that we here highly resolve that these dead shall not have died in vain; that this nation shall have a new birth of freedom; and that this government of the people, by the people, for the people, shall not perish from the earth. Edward Everett was the main attraction at the service at Gettysburg. He spoke a full two hours. After hearing the president speech for only two minutes, Everett wrote to him saying, "I should be glad, if I could flatter myself that I came as near to the central idea of the occasion, in two hours, as you did in two minutes." In 1864 Everett asked the President for a copy of the speech, again as a fundraiser for Union soldiers. This copy is housed at the Abraham Lincoln Presidential Library and Museum. Four score and seven years ago our fathers brought forth, upon this continent, a new nation, conceived in Liberty, and dedicated to the proposition that all men are created equal. Now we are engaged in a great civil war, testing whether that nation, or any nation so conceived, and so dedicated, can long endure. We are met on a great battle-field of that war. We have come to dedicate a portion of that field, as a final resting-place for those who here gave their lives, that that nation might live. It is altogether fitting and proper that we should do this. But, in a larger sense, we can not dedicate, we can not consecrate – we can not hallow – this ground. The brave men, living and dead, who struggled here, have consecrated it far above our poor power to add or detract. The world will little note, nor long remember what we say here, but it can never forget what they did here. It is for us, the living, rather, to be dedicated here to the unfinished work which they who fought here, have, thus far, so nobly advanced. It is rather for us to be here dedicated to the great task remaining before us – that from these honored dead we take increased devotion to that cause for which they here gave the last full measure of devotion – that we here highly resolve that these dead shall not have died in vain – that this nation, under God, shall have a new birth of freedom – and that government of the people, by the people, for the people, shall not perish from the earth. If you would like to know all things about the Gettysburg Address, do read Gabor Boritt's The Gettysburg Gospel. While I am not a big reader of Lincoln books, I was interested in this speech and how it came about.